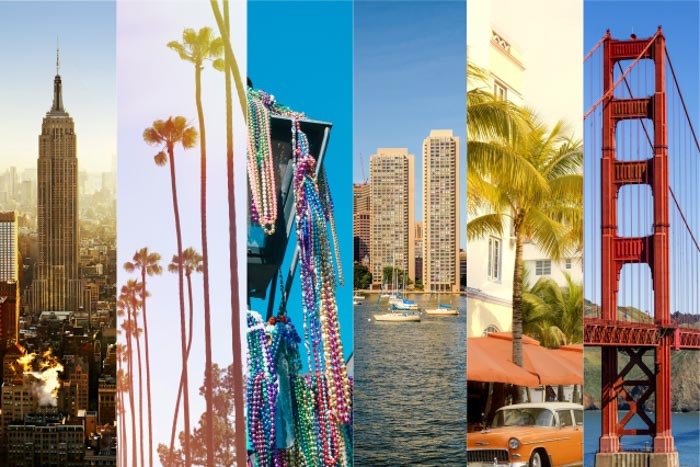 Quiz: Which American city should you visit? Home Travel Tips & News Quizzes QUIZ: Which American city should you visit based on your packing style? A city break in the USA is always a good idea. What could be better than actually getting to visit all those places that have been immortalised in so many Hollywood movies? However, with so many cities to choose from, narrowing down exactly where to go could be quite tricky. Luckily, each major American city has its own personality, that’ll perfectly suit each type of traveller. But what kind of traveller are you? If there’s one way to find out, it’s by checking out your travel bag. Take our quiz to decide which American city is right for you based on your packing style. Then read up on your results and search for flights on Cheapflights.co.uk to make this dream American city break a reality. Alicia Keys is so right when she sings “New York, these streets will make you feel brand new, big lights will inspire you…”. It’s one exciting place. But back to your packing style. You’ve probably packed a mix of fun and varied things, which makes New York your perfect match. The Big Apple has a unique culture and an interesting history, along with the perfect mix of urban architecture and iconic sights. From shopping on 5th Avenue to lazy afternoons in Central Park, there really is no shortage of ways to fill your days in iconic NYC. Just like you daydreamed about the iconic Hollywood sign and those LA beach sunsets long before your trip, you like to envision the items in your luggage before you pack them. You appreciate having a mental snapshot of the places you’ll go to and the things you will do. Much like LA’s easy going yet unique culture, your packing style is laid back, but your luggage is sure to contain some interesting items. Los Angeles is known for its bold attitude and you’re known for owning that one rather vibrant shirt (which definitely will make its way into your suitcase). For you, your lack of packing style *is* your packing style. Always on the lookout for adventure and fun, your past experiences have imparted you with the wisdom that some of the best adventures happen when you don’t over-plan. New Orleans offers an exciting, on-the-go atmosphere, which allows you to explore at your own pace. From buzzing bars and exciting nightlife to delicious food and good music, New Orleans is different America, with its own distinctive culture and pace of life. New Orleans is ready and waiting for you. You live for preparation and love to be the person that has that one thing your travel companion forgot (because let’s be honest, they always forget it). Boston has neat and orderly down to a T – just like you. But that doesn’t mean it’s boring. There is so much to see and do. From historic walks to giant ocean tanks and world-famous seafood, activities abound… but you’ll want to do your research first. With an increasing number of flights, it’s easier than ever to make that Boston break a reality. You are a minimalist packer, which may have something to do with the fact that where you’re headed, you won’t need to get out of swimwear. Miami is the perfect spot to bask in the sun and sip on Mojitos while indulging on some good old fashioned American grub. Like with your suitcase, you want to fit as much into your holiday as possible. This makes San Francisco your perfect fit. It offers tons of activities; just think of all the sightseeing you could do. The list includes the Golden Gate Bridge, Alcatraz Prison, Fisherman’s Wharf’s cute seal residents, nearby woods, beaches and so much more. San Francisco is one of those places in America where one just a one-week holiday won’t be enough. Now that you know which American city is a perfect match to your packing style, it’s time to start booking your flights. You can easily do that Cheapflights.co.uk where you’ll be able to find everything – cheap flights, hotels and car hire – all in one place.